Last July’s immolation murders made world headlines. 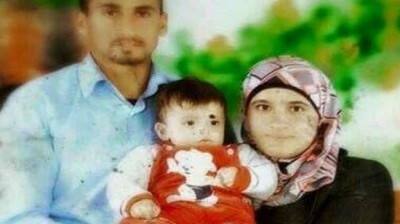 Three Palestinian Dawabsha family members succumbed to devastating third-degree burns too severe to save them, including 18-month-old infant Ali. Four-year-old Ahmed alone survived, still hospitalized in intensive care. His painful struggle to recover continues. Israel stonewalled for months, knowing the guilty parties, refusing to bring charges on the phony pretext of “protect(ing) the identity” of alleged intelligence sources, effectively sanctioning cold-blooded murder. Had one or more Palestinians committed a similar act against Jews, they’d likely have been hunted down and extrajudicially executed – denied due process and judicial fairness. Perhaps the lingering effects of brutal murders capturing world attention finally got Israel to act. On Sunday, two Jewish terrorists were indicted for murder. Amiram Ben Uliel, aged 21, faces three murder charges, an unnamed minor indicted as an accomplice. Two others (possibly three) face terrorism related charges along with the two murder suspects. A gag order remains in place so further details aren’t known, including whether suspects were released pending trial. Much about the investigation and ongoing process remains confidential. The Palestinian public’s right to know is ignored. Justice Minister Ayelet Shaked suggested the suspects may not be tried fairly, barely stopping short of supporting their immolation murders. Will prosecutions result in slap-on-the-wrist sentences, perhaps commuted after short-term imprisonment if any hard time is imposed? Why did Israel wait five months to act when the killers were known last summer, should have been arrested and prosecuted straightaway, leaving doubt now whether justice will be served? A court is set to hear arguments to lift some gag order restrictions. Attorney Itamar Ben Gvir, representing several of the suspects, said their confessions were obtained through torture. Shin Bet claims they only faced “moderate physical pressure,” legal in terror investigations, not subjected to torture or other forms of abuse. What happens at trial and its aftermath remains to be seen. Israel crimes against Palestinians almost never are punished. Extremist settlers freely commit violence and vandalism unaccountably. Israeli soldiers and militarized police extrajudicially execute defenseless Palestinians with impunity. They’ve been denied justice for nearly seven decades. Nothing in prospect suggests change.